Published June 4, 2015 - NEW HAVEN, Mo. - Throughout the past school year, QuickNewsNow owner, Kyle Quick, has been working with New Haven High School’s principal, Josh Hoener, about their new journalism class taking over the QNN website after Quick approached him about donating the site to the school district. 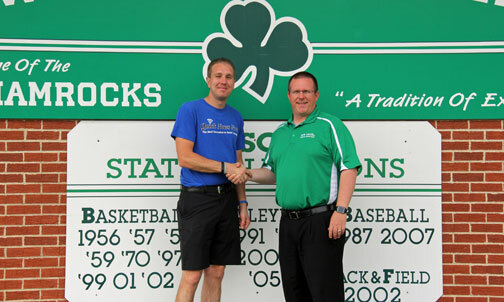 New Haven High School Counselor Doug Peirick presents Kyle Ruediger, recipient of both the Scheer Memorial And Langenberg Family Scholarships. NEW HAVEN, Mo. - New Haven High School senior Kyle Ruediger is this year's recipient of New Haven High School’s oldest privately endowed scholarship: the Scheer Memorial Scholarship as well as the 8th annual Langenberg Family Scholarship. Ruediger becomes the first ever to receive both scholarships. 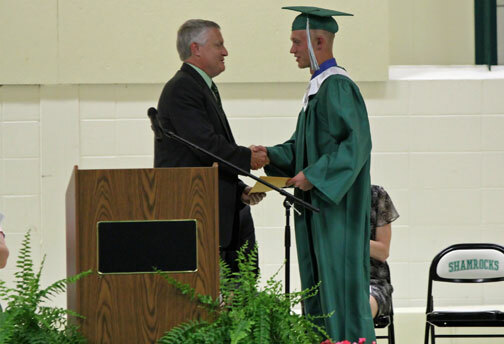 Kyle, the son of Rick and Pam Ruediger, received the scholarship worth $5,000 at the school's 109th annual commencement exercise last Friday night. The Scholarship is payable during a four year period. This is the 25th year for the scholarship honoring the memory of the late Clara and Milford F. Scheer and is funded by the Milford F. Scheer Charitable Trust. New Haven High School Counselor Doug Peirick presents Mackenzy Vedder the William N. Kelly Scholarship. NEW HAVEN, Mo. - Mackenzy Vedder, has been honored as New Haven High School’s eleventh recipient of the William N. Kelley Family Scholarship from the Class of 2015. 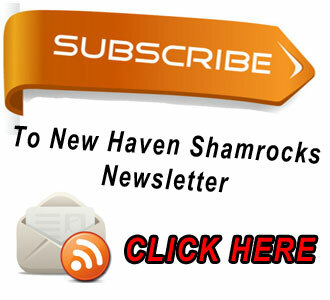 The “William N. Kelley Family Scholarship for Science & Engineering Scholarship” was established by the William N. Kelley family, Mary, Bill, Bill, Jr., and Tim, to show their appreciation for the educational opportunities offered by the New Haven School District and to encourage the future of science and engineering in America. Mrs. Melissa Schwab, long-time English teacher at NHHS, will not be returning next year. Her family is moving away from this area over the summer. She will soon begin earning her doctorate while working as a full time CrossFit coach. Mrs. Schwab is a cherished teacher at New Haven High, always willing to help students and bring on new ideas. Mrs. Schwab has been a teacher at New Haven High school since 2002. She moved to this area because her husband was transferred here for work. Before Mrs. Schwab came to New Haven, she was an English teacher at Leopold High School, where she was the only English teacher, and the school had about 90 kids. NEW HAVEN, Mo. - On Monday (May 18) New Haven Elementary students and faculty and staff joined members of the New Haven PTO in an official ground breaking ceremony, marking the beginning of construction and eventually installation of state of the art equipment. That afternoon not only did students play on the current equipment one last time, but teachers and PTO members also joined in on the fun. 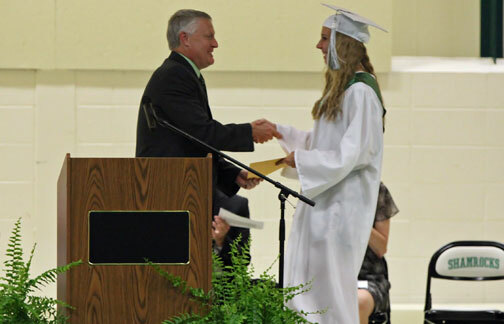 NHHS Graduation Will Be Streamed Live Tonight at 8 p.m.
Read more about NHHS Graduation Will Be Streamed Live Tonight at 8 p.m.
Pictured is Kyle Quick presenting Katie Peirick and Molly Munsinger the Ty Quick Athletic Memorial Scholarship. (Photo courtesy of Katie Borcherding) Below are excerpts from both recipient’s amazing essays. NEW HAVEN, Mo. 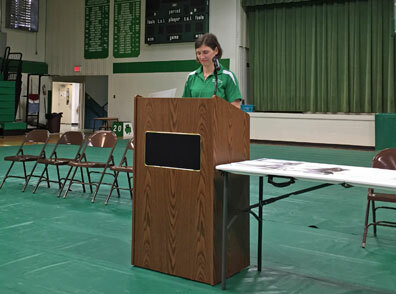 - On Friday May 15 at New Haven High School’s Annual Awards Breakfast Kyle Quick announced the recipients of the 10th Annual Ty Quick Athletic Memorial Scholarship to Katie Peirick and Molly Munsinger. Both were awarded a $1,000 scholarship, making this year the first time that two scholarships were awarded. NEW HAVEN, Mo. - Sunday night as New Haven’s Class of 2015 enter the last two days of their high school careers they decided to take the opportunity and spend one last time together as a class. NEW HAVEN, Mo. - This year New Haven High School’s senior student-athletes set a new standard for “A Tradition of Excellence”. Five student-athletes achieved this recognition this year, which is the most New Haven High School have ever had in one year. 2. Have been selected 1st Team All-Conference in any sport at anytime throughout their high school career. 3. Must have lettered in that sport their senior year. 4. Earned a 3.25 cumulative grade point average.